393 Beacon is located on the south side of Beacon, between Fairfield and Gloucester, with 391 Beacon to the east and 395 Beacon to the west. 393 Beacon was designed by architect Frederick B. Pope and built ca. 1869, one of ten contiguous houses built as five symmetrical pairs (377-379-381-383-385-387-389-391-393-395 Beacon), each house on an 18 foot wide lot and each pair united by a shared portico. 377-379 Beacon are one story higher than the other four pairs, and probably were built that way (they appear as such on the 1887 Sanborn map). Click here for an index to the deeds for 393 Beacon. The agreement to build 393-395 Beacon, dated January 23, 1869, originally was between Eben Jordan and Frederick Pope. Frederick Pope agreed “to furnish all materials and build for said Jordan on land owned by him situated on the southerly side of Beacon Street, between Fairfield and Gloucester Streets, two brick dwelling houses of the dimensions and arrangements described in plans and specifications signed this day by the parties.” Eben Jordan agreed to convey the land to Frederick Pope at a specified price when the houses were completed. On February 3, 1869, the parties agreed that George Gibson would take Frederick Pope’s place in the agreement, and on April 3, 1869, the parties further agreed that Eben Jordan would retain the 36 foot lot where 393-395 Beacon would be built and, instead, would transfer to George Gibson a 12 foot lot to the east, where 391 Beacon would be built. On May 30, 1870, 393 Beacon was purchased from Eben Jordan by Harriet H. (Shelton) Randall, the wife of Charles T. Randall, a commission merchant. They previously had lived in Jamaica Plain. Charles Randall died in April of 1883. Harriet Randall continued to live at 393 Beacon. During the 1887-1888 winter season, Harriet Randall was living elsewhere and 393 Beacon was the home of Abner Augustus Griffing and his wife, Abbie Chandler (Stetson) Griffing. Abner Griffing owned an iron foundry in Jersey City where he manufactured radiators. They probably were in Boston because their son, Edward Stetson Griffing, was attending Harvard. 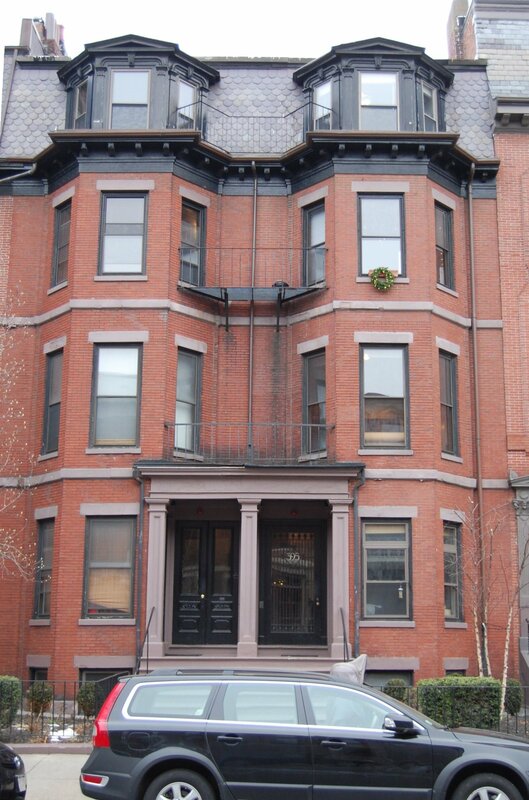 Harriet Randall was living at 393 Beacon again during the 1888-1889 winter season, but was again living elsewhere during the fall of 1889, when 393 Beacon was the home of Captain Robert Bennet Forbes. He was a retired shipping merchant who had been engaged in the China trade. A widower, he had lived at 216 Beacon during the 1888-1889 winter season. He maintained his primary residence in Milton. He died at 393 Beacon in November of 1889. By the 1890-1891 winter season, 393 Beacon was Mrs. Randall’s home again. She continued to live there until her death in January of 1894. On June 8, 1894, 393 Beacon was purchased from Harriet Randall’s estate by Josephine (Forbush) Johnson, the wife of Samuel Johnson, II, a dry goods merchant. They had married in February of 1894 and 393 Beacon probably was their first home together. Prior to their marriage, she had lived at 369 Beacon with her sisters, Ada and Maria Forbush. The Johnsons continued continued to live at 393 Beacon during the 1900-1901 winter season, but moved thereafter to Milton. On December 5, 1901, 393 Beacon was acquired from Josephine Johnson by the trustees under the will of Samuel Johnson’s father, Dr. Amos Howe Johnson, and it became the home of Samuel Johnson’s mother, Frances Seymour (Benjamin) Johnson. She previously had lived in an apartment at 330 Dartmouth. During the 1905-1906 winter season, Frances Johnson’s son, Philip Seymour Johnson, a broker, lived with her. He was a widower and in February of 1906, he married again, to Edith Atherton. They moved to Brookline. Frances Johnson continued to live at 393 Beacon until her death in December of 1912, joined from about 1911 by her granddaughter, Josephine Johnson, the daughter of Samuel and Josephine Johnson. 393 Beacon continued to be owned by the trust established under Amos Johnson’s will. By the 1913-1914 winter season, 393 Beacon was the home of Dr. Harry Fairbanks Hartwell and his wife, Olive (Barber) Hartwell. 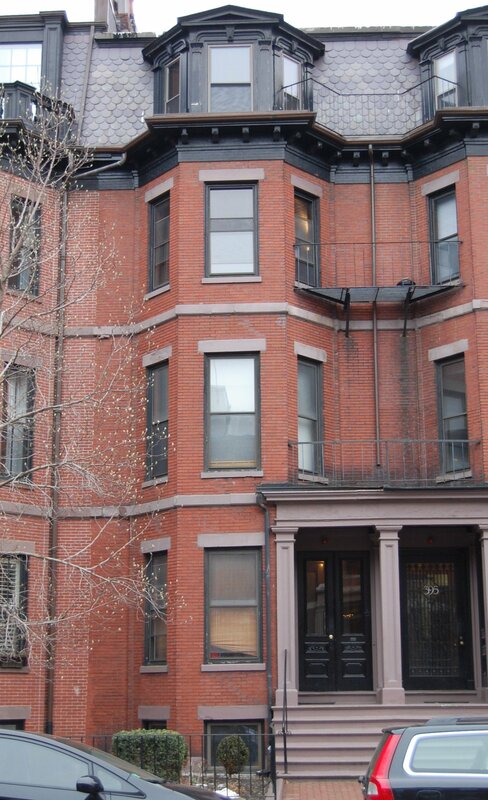 He was a physician and instructor at Harvard Medical School, and also maintained his medical office at 393 Beacon. They previously had lived (and he had maintained his medical office) at 9 Massachusetts Avenue. They continued to live (and he to maintain his office) at 393 Beacon during the 1914-1916 season, but moved thereafter and were living in Newton by 1920. 393 Beacon was not listed in the 1917 Blue Book. During the 1917-1918 winter season, 393 Beacon was the home of Kenneth Moller, a mechanical engineer, and his wife, Elizabeth Soule (Sweetser) Moller. 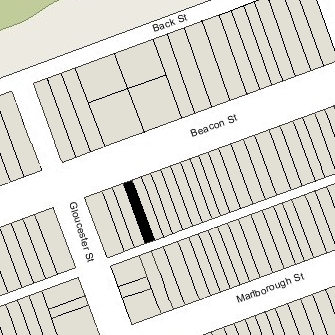 They previously had lived at 348 Marlborough. They moved soon thereafter to New York, where Elizabeth Moller died in December of 1918. By the 1919-1920 winter season, 393 Beacon was the home of Shepard Krech and his wife, Mary Stevens (Chapin) Krech. He was a student at Harvard Medical School and would later become a noted physician and surgeon in New York City. They continued to live at 393 Beacon in 1922, but by 1923, they had moved to 441 Beacon. By the 1922-1923 winter season, 393 Beacon was the home of Miss Alice Stackpole, a landscape artist. She previously had lived at 292 Beacon. She also maintained a home in Mattapoisett. In June of 1943, 393 Beacon was purchased from the Johnson family by Horace Upham Ransom. He and his wife, Sarah Chaplin (Bent) Ransom, lived in Meredith, New Hampshire. On July 1, 1945, he transferred the property into his wife’s name. Alice Stackpole continued to live at 393 Beacon until her death in January of 1949 while attending the symphony. On April 27, 1949, 393 Beacon was acquired from Sarah Ransom by Octavia Morley (Sawyer) Walsh, the wife of Edward M. Walsh, a heating contractor. They lived at 128 Marlborough. On October 4, 1949, 393 Beacon was acquired from Octavia Walsh by Hyman Norwood (Narkoonsky) and his wife, Rose (Finkelstein) Norwood. They previously had lived at 33 Fessenden. Hyman Norwood owned a tire and battery business; Rose Norwood was a labor union organizer. The Norwoods operated 393 Beacon as a lodging house (although they appear never to established the legal occupancy as such). Hyman Norwood died in January of 1957. On May 8, 1963, the Norwoods’ two children, Bernard Norwood and Barbara Norwood, transferred their interests in the house (inherited from their father) to Rose Norwood. She continued to live at 393 Beacon until the mid-1970s. On April 23, 1976, 393 Beacon was purchased from Rose Norwood by Patrick J. O’Brien and his wife, Catherine O’Brien. They lived in West Roxbury. They continued to operate the property as a lodging house. On June 8, 1976, the O’Briens transferred the property to themselves as trustees of the Catherine Realty Trust. In October of 1977, they acquired 395 Beacon. In November of 2008, filed for (and subsequently received) permission to legalize the occupancy of 393 Beacon as a lodging house (there being no record of the legal occupancy on file with the Building Department). As of 2017, 393 Beacon was assessed as an apartment house.